YouTube 360 is now called YouTube 3D. Using a rig that looks like a cube or ball of cameras with lenses pointing in six directions, one can create a video that lets the viewer experience the scene as if they were actually there. Also new, and rare at this writing, is “spatial audio,” which seems similar to the SurroundSound(™) feature of high-end music recordings. With a multi-speaker rig at home or office, one of these enhanced videos can replicate the audio experience of a train passing from the viewer, sound rising from the left (or behind) and fading to the right (or “ahead”). The viewer controls for YouTube 360/3D will be familiar to anyone who has used Google StreetView. In a browser, you’ll see a circle with four directional arrowheads in the upper-left corner of a video. Click on an arrow to “turn” in that direction, including up/down; alternatively, “grab” the image with the mouse cursor-hand and turn it the way you want. On Android mobile devices, the experience is even more like being there. YouTube’s app uses a device’s built-in accelerometers to sense the direction in which the device is being turned, and turns the video’s point of view accordingly. So if you see someone walking down the street and turning in circles while staring at a phone, don’t call the “nice young men in their clean white coats” - at least, not right away. He’s probably harmless and just indulging in YouTube 360/3D. Check out this playlist of 360-degree videos and look around in all directions as you watch the action. Or check out these 360-degree videos with spatial audio. Just don't wander into oncoming traffic while doing so. If you want to create your own 360-degree videos for Youtube, you'll need some special equipment. Some cameras compatible with YouTube 360/3D include BublCam ($799), the Giroptic 360cam (pre-order, $499), Kodak’s SP360, (Amazon, $580) and the sleek Ricoh Theta ($350) All of these and others contain software that works with YouTube’s software to make uploading and preparing immersive video for streaming dead simple. This expensive gear is also available for rent at YouTube Space locations. 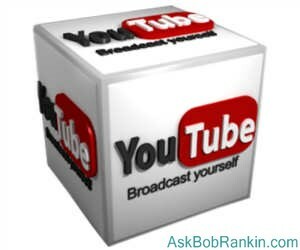 These are video recording studios that YouTube makes available to creators. There are not many of them: Los Angeles, London, Tokyo, New York, São Paulo, Brazil, Berlin, Paris, and Mumbai are all we have so far. Predictably, YouTube 360/3D is a bandwidth hog, so if you have a metered connection at home, or a mobile device, keep an eye on your data consumption. YouTube 360/3D will eat it up like popcorn. You'll also need a decent high-speed connection to enjoy this type of media. It works fine for me with a 50Mbps connection, but one friend reported that on his 10 Mbps home broadband connection, streaming was jerky. Who Needs Netflix When You Have a Library Card? [RED ALERT] Would You Pay for YouTube? Roku and Friends: Can You Cut the Cable? Can I Get Sued For Watching Online Video? [SCAM] Have You Been Skimmed? [READ] Are Public Libraries Obsolete? Most recent comments on "[COOL] YouTube 3D Offers Virtual Reality"
It is very cool technology. Unfortunately it seems easier to use technology to create wow scenes than to write a good script that actually has something to say. More and more I prefer older films that have less technology but more actual content, at least for me. Do any of them support Google cardboard? There is freely available 3D video with superb sound qualities without an app or even a phone or tablet if you just turn your device off and unplug your ears and go for a walk on a nice day. You may even meet someone and have a wonderful conversation. Very interactive. Well said, Chris! In a brief look at this amazing technique I saw a whole raft of young men enjoying themselves with deadly rapid fire guns. Bet your National Rifle Association loves this. In Oz we're lucky to have stricter controls over these weapons. Yes, Chris' "interactive" comment is the best 3D video and audio around -and you won't fall off curbs or get run over (at least, not likely). I just went to the You Tube 360 site and played the Tomorrowland video. Watching it was a bit like a salvia divinorum trip, but no matter how hard I tried, I could NOT see anything remotely resembling a new form of 3D video... maybe I should have smoked a joint first?